Agatha, Macavity and American Mystery Award winner Hess sends her bookseller sleuth Claire Malloy (seen last in Busy Bodies) far from her small Arkansas town of Farberville in this tightly woven tale. Out of the blue, Claire receives a call from a cousin whom she understood to have died 30 years earlier. Veronica Landonwood, who at age 17 was jailed for murdering an American movie producer in Mexico, has since made a new life for herself as a medical researcher. But now, she says, someone is threatening to reveal her past if she doesn't hand over $1 million and she insists that Claire, whose detecting exploits she has secretly followed, is the only one who can save her. Claire takes her teenage daughter, Caron, to Acapulco to find out who among those involved in the murder and subsequent trial is still living and might be blackmailing her cousin. 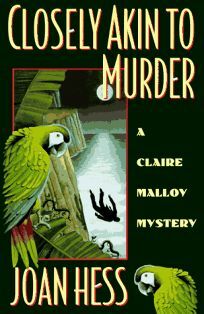 When their hotel keeper is murdered and Caron is abducted for ransom, Claire is thrown in with a Mexican family of dubious means. She sets out on a path, marked by seven bodies and nearly as many mistaken identities, that takes her to Arizona and Illinois before leading her and Caron safely back in Farberville. Hess knots deceit upon deceit into this suspenseful story, whose tone is lightened by Claire's quick wit and warm heart. Mystery Guild selection. (May) ~ FYI: Hess also writes the Maggody mystery series.